Lori Riggins Photography: Becca's the TOPS! There was a recent election in Becca's class for Student Council. When Becca came home and told me she wanted to run for Girl Representative, my first thought was to talk her out of it. While Becca is well-liked in her class because she's sweet and kind to everyone, she's shy and softspoken, and I was SO afraid she would be upset if she didn't win. But after I made sure that she understood she would have to stand up in front of everybody and give a speech, I bit my tongue. 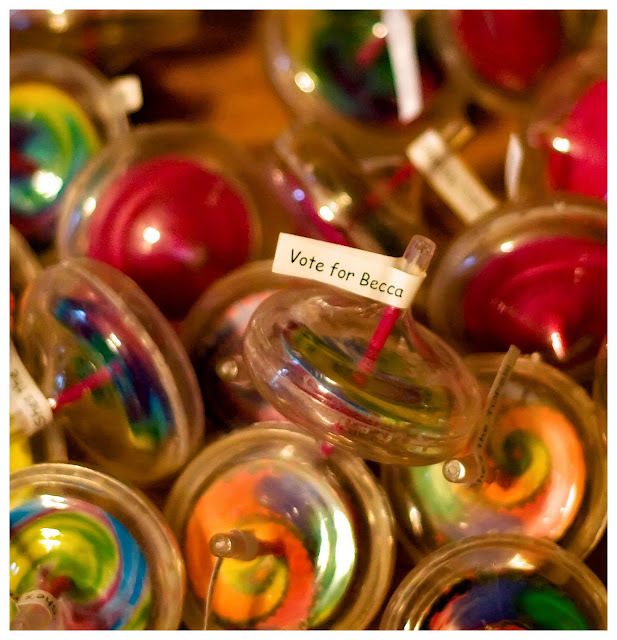 We worked on her speech, and made some Rockin' campaign posters, and we also made these tops to hand out - the labels read "Vote for Becca" on one side, and "She's the TOPS!" on the other. Well, Election Day came, and sure enough, she didn't win. But I'm SO proud of her for trying, and being a gracious loser. I forget sometimes that she's much braver than I ever was at that age, and even though she's quiet and shy, she's very strong. Thats really cool. I'm proud of her too. My 8 yr old dd is a soft spoken, shy lil girl. JOb well done. Oh what a cute idea. Glad she ran even if she didn't win, what a great experience for her. First of all...good for you mom. I think it's oh-so important to expose her to stuff like this. Winning is not everything and she needs to know it's ok not to win. Second...what amazing campaign tokens-so creative and clever, wow! Good for her, and what a cute campaign idea! What a great slant for the campaign! I am glad she tried; she will be the stronger for it, pushing outside her comfort zone. fun pic, what a great idea! yay for her for trying and doing well, that is awesome! WTG Becca! That is just awesome that she gve it her all and ran. You must be so proud. What a cool idea! Love the colors... better luck next time! !